The studio is located in the heart of the Hatikva Quarter in southern of Tel Aviv. This section is considered to be one of the weakest socioeconomic areas in Tel Aviv, struggling with neglect and poverty. Active community involvement is an important element of the school’s identity as a professional acting institution. The Studio aspires to nurture a new generation of actors who are rooted to the society in which they live, and therefore will become leaders in the field of acting in Israel. The Studio seeks to create bonds of reciprocity with its community that contributes to the artistic and personal development of it students. In this way we seek to use art to benefit both are students and our community. The Tikva neighborhood, situated in southeast Tel Aviv, is an area that is one of neglect and poverty. Most of Tikva’s residents are new immigrants, refugees, migrant workers and native Israelis this mix has lead to harsh circumstances and consequentially low quality of life. Our Community Theatre Workshop Project is located in the heart of this neighborhood to reach out to our neighbors and to address their daily tribulations in a way that speaks to them, in efforts to ameliorate the complex, delicate situation at hand. The Studio is located in the heart of the Hatikva Quarter in South Tel Aviv. This section is considered to be one of the weakest socioeconomic areas in Tel Aviv, struggling with neglect and poverty. Active community involvement is an important element of the school’s identity as a professional acting institution. The Studio aspires to nurture a new generation of actors who are rooted to the society in which they live, and therefore will become leaders in the field of acting in Israel. The Studio seeks to create bonds of reciprocity with its community that contributes to the artistic and personal development of it students. In this way we seek to use art to benefit both our students and our community. The Tikva (“Hope” in Hebrew) neighborhood, located in Southeast Tel Aviv, is home to 16,000 residents. These residents are immigrants, refugees, foreign workers, and families subjected to trying socio-economic realities and poverty. The neighborhood itself looks run-down and neglected–a reflection of its resident's tumultuous and straining daily lives. In the view of its ongoing demographic change, order and stability seem far from the vicinity's reach, and Tikva’s people are faced with a perilous, difficult existence at large. "Tikva" means hope, which, in addition to much more, is what the neighborhood residents undoubtedly need. Given its harsh circumstances and the consequentially low quality of life to most of Tikva's residents, addressing their daily tribulations in a way that speaks to them has become crucial in our efforts to ameliorate the complex, delicate situation at hand. Targeting 16 different disadvantaged groups– made up in part by children and youth at risk, immigrant children from broken homes, children and youth suffering from mental disorders, youth at risk from the religious sector, youth on the edge, elementary schools in the neighborhood, children of migrant workers, the visually impaired and the blind, the elderly in need of assistance and others–the project focuses upon these people's need for confidence and hope. Tikva's difficult reality can only be altered through the skill-building of teamwork, communication and reconciliation as well as the fostering and development of creativity, support and self-esteem. Theatre provides all of these tools. Theatre is an ancient art form and a first-class tool on the plane of creative intervention and deeper understanding. Indisputable instruments from the dawn of civilization, theatrical traditions have long served to convey messages, develop moral values, express ideas, vent feelings and create a sense of community and cultural identity. A highly acclaimed, leading institution in the Performing Arts, the Studio has been home to distinguished professional knowledge in the fields of teaching and producing drama theatre since its foundation in 1988. Participants of the Stars of Hope project are subject to significant liberation and consequential socialization by virtue of their exposure to the theatre arts of the Studio and the inspirational, transformative workshops. The school's students are carefully chosen for their talent, motivation, passion and generosity of character, thus presenting esteemed examples to those participants whose lives and community improvement depends on personal choices, inspiration and willingness towards change. Teachers of the program, social workers and psychologists not only train the school's second and third year students on how to approach the project and its participants, but also provide regular ongoing support to the group leaders and the project itself in order to ensure its success. 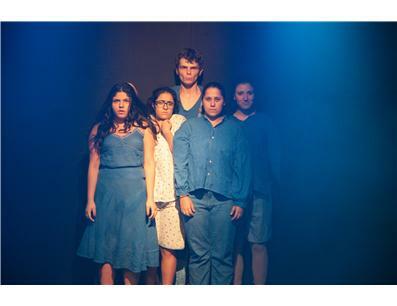 Finally, the school has access to leading theatre stages in Israel and abroad, providing a secure option of performance platforms for productions developed from the Stars of Hope project! There are no secrets between the actors, no shame. They are all familiar with the hardships of their peers. The plays are a refuge for them; here they can escape the beatings, the yelling and the hardship. One actress recounted that she came to Yoram Loewenstein’s studio when she was twelve and a half because she felt lonely and liked to write poetry. Loewenstein recognized the young girl’s latent potential, invited her to audition and promptly accepted her. “My mother is addicted to gambling, my father’s an alcoholic, and my brothers are drug addicts”, she relates the story of her life. “My family doesn’t know anything about me. When I was in fifth grade I discovered things about myself that only my friends in the troupe know. Before I got to know them, I was completely alone. I didn’t speak and suffered from all kinds of fears. This group and this theatre are my family’s reformation”. David, a student at the Performing Arts Studio, was committed to a psychiatric hospital after suffering depression and attempting suicide. He discovered acting thanks to a Studio project designed to introduce youth at risk to the world of theatre. Today David reveals for the first time that he has left despair behind, the days when he was restrained in his hospital bed and wanted to end his life. “I was in a bad state even then. I had to look for reasons to get up in the morning. I had no contact with teachers or students, only with myself. No one knew anything about me. I’d come home from school, go to my room and not come out until the next day”. David recounts that he did not care about his grades or the other students, and the turning point came when he decided he had nothing to live for. “That same night I went to the bridge over the Kibbutz Galuyot interchange”, David recalls. “I wanted to jump, but a voice inside me told me to go back”. After six months of hospitalization he began to take the right path. A doctor from the Hatikva Quarter referred him to Halil, an actor and the coordinator of the community activity at the Performing Arts Studio who is responsible for the Youth at Risk Project. “I wanted to go back to the hospital, where I could shout, cry and go crazy without anyone saying anything about it”, says David. “Despite that, I decided to go and see what goes on there. When I entered the Studio, I felt a connection with it. I suddenly felt the need to meet people. My life revolved between the hospital, where I was hospitalized for an additional six months, and the Studio. For the first time in my life I was happy. There is complete freedom on the stage”. Today David is far removed from the world of depression, thanks in no small measure to the world of acting. He is currently completing his matriculation exams and will be enrolling at the Studio as a regular student. Halil, initiator of the project, praises David: “David has the potential of becoming an actor. Today he already knows what an audience is and how to perform a monolog”. Halil recounts how the idea of creating the Youth at Risk Project came into being. “About three years ago I thought that we should take advantage of the Studio’s location to hold activities for the benefit of the community”, he relates. “Yoram Loewenstein was in favor, and I brought young people off the streets who had been cast out of the education system. The senior students teach them, and in this way they return to a framework”. David feels that he has not only been given a temporary framework. He does not intend to give up acting. “I’m going to work very hard to become an actor. It’s my dream”, he says enthusiastically. “If I hadn’t come here, it’s more than likely that I would have remained hospitalized or committed suicide a long time ago”. Director of the Performing Arts Studio, Yoram Loewenstein: “The Studio considers itself part of the community. Second- and third-year students teach acting in the community as part of their training. The students are exposed to a variety of cultures and to all types of drama and human complexity”. A person can volunteer and see reharsals, see shows or can be in personal contact with the participants of the program. 32 guides, 300 participants and thousands of viewers that see the outcome. We are located in the heart of the Hatikva Shuk (open market). We are between the colorful vegetable market and the meat market.